There are various figures of speech that talk about workplace relationships, and most of them are in the negative. "Don't make honey where you make money," or "Never foul your own nest" are just a couple fit to print here. 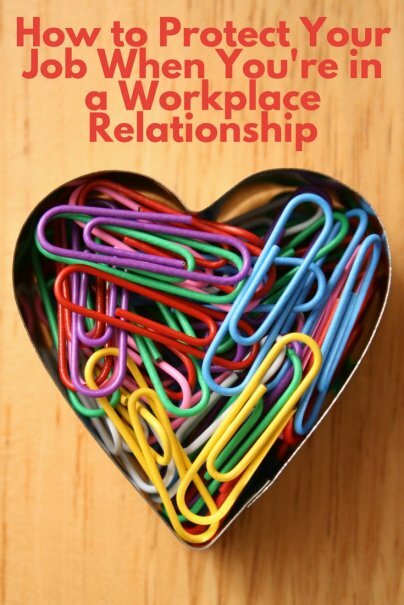 It seems that the overall rule of thumb is to avoid workplace relationships like the plague. However, they happen. A lot. And if you find yourself in one, how do you ensure that it doesn't impact your job, or even your career? Most human resource departments have some kind of company or employee handbook that provides guidelines for behavior in and around the office. Before you get too involved in any kind of office romance, check this to see what it says about the implications of dating a coworker. It's possible your company may prohibit office relationships, although it's highly unlikely it would ever be enforced. However, you should disclose the relationship to Human Resources and your manager. It may also need to be documented, especially if the relationship brings about conflict of interest concerns. Almost every business will frown on a supervisor and his or her direct report having a romance, for obvious reasons. You will usually get a gut reaction to your own fledgling relationship based on other activity you've seen in the office. If you've been invited to the wedding of two coworkers, or see couples holding hands in the office with no backlash at all, you're probably fine. If you haven't seen or heard a peep about any workplace hookups, you may have to tread very carefully. Or, figure out which of you should find another place to work, if you want to keep the relationship alive. In the very early stages, only two people in the office should know about your relationship, and that's you and the person you're dating. Don't do public displays of affection. Don't leave each other little notes, or giggle in the elevator together. Don't start going to lunch with each other every day, and arrive in the same car in the morning. You want this to be kept quiet until you are sure it's nothing more than a fling. If it's serious, you can inform HR, and if necessary, your managers. But even after that, keep it professional. You are still in a place of business, and you were both hired to do specific tasks. Those tasks will not be improved by bringing your relationship into it. And if you are arguing, or going through a rocky patch, you also need to separate that personal side from the professional side. If it becomes clear that your romance is affecting your performance, one or both of you could be let go. That old saying "Loose lips sink ships" is not just for wartime. In this case, that ship could be your career, and if you do not establish firm boundaries from the get go, you could start violating trusts that lead to gossip, rumors, and a toxic work environment. It's possible that you know much more about a certain project or coworker than the person you're dating. They might want to know more than they are allowed to, or vice-versa. "Go on, tell me, are layoffs coming soon? Which departments are affected? Is anyone getting a promotion?" These questions can overstep the company boundaries and result in disciplinary action for both parties. Then, there's the question of favoritism. You may be dating someone who is part of your team. You may be dating someone with significant influence. If you seem to benefit from that relationship, even if it's completely unrelated, it can seem like a huge dose of favoritism. "He only got promoted because he's dating the best friend of the boss." Take these things into account, because it can cause a lot of ill will and low morale among other employees. Try not to date "up or down"
Obviously, it will be hard to deny certain feelings you both have for each other. But, if one of you is much higher up in the company than the other, things can get messy very quickly. Word will spread that you are in a relationship, despite your best efforts to conceal it. Then, you will be under scrutiny constantly. Are you receiving special treatment, or giving it to your partner? Are you sure you're making decisions based solely on the best interest of the company, or are they being swayed by your affections? Are you getting a little upset that your partner travels a lot, while you are stuck in the office? Or, that they get perks that you do not at your level? All of these problems, and many more, can happen when you date up or down. So, stick to relationships with people on a similar level to you in the company. And if one of you starts advancing more quickly than the other, reassess the situation. Is it going to cause problems? If you are put in charge, or report to your partner, you'll have something of an HR nightmare on your hands. It's sad, but true, that we now live in a world that provides us with a plethora of data on anyone we wish to investigate. Emails, Facebook profiles, text messages, Snapchat, photos, videos, you name it, it's out there. It's possible your relationship could cause jealousy among other coworkers, and wild accusations could be made. If you can document that your partner got a raise or promotion through his or her achievements, and not the relationship, then you can shut down those creaking gates quickly. And if you should break up, those wild accusations may come from the person you were seeing. Again, good documentation can save you from some messy, fictional scandals. Your office romance may last until the end of your life. It may also be over in a few weeks, months, or years. If the relationship does come to an end while you are both still working for the same company, tread very carefully. You may well be in a position to make life a living hell for your ex, and if he or she left the relationship on a sour note, you may be very tempted to. However, it can only lead to pain and suffering for both parties, and to a lesser extent, the rest of the company. A well-oiled machine may break down due to animosity, or even hatred. If the other person is dating someone new, jealousy could drive your decision-making. When that happens, it's a slippery slope to a vendetta, and the loss of a job for one or both of you. So, keep it professional. If it's painful to see each other at work after the break up, find ways to avoid the other person. Can you be transferred to a department that provides less contact? Do you have to go to every meeting, or will emails and phone calls suffice? And the big question … should one of you move on to a different company? Remember, while it's not advisable to get involved with someone at the office, if you establish a real connection with someone, you should let nature take its course. You may find that one amazing person that you spend the rest of your life with; jobs, on the other hand, come and go.